Synonyms: Looking Back at it All: The Dragon Ball Z Year-End Show!, Zenbu Misemasu Toshi Wasure Doragon Boru Zetto! 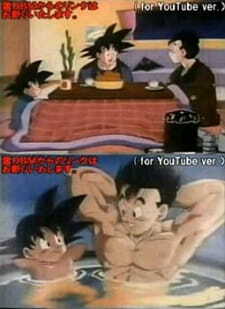 In this film, which is believed to take place some time around the 25th World Martial Arts Tournament, Gohan and Goten are having a hot bath outside in the middle of winter. Goku (who is still dead) suddenly appears in front of his sons with the help of his Instant Transmission, and joins them in the tub. While there, the three Saiyans reflect back on the events that occurred during the Cell Games. Inside the house after Chi-Chi appeared, Goku tells his sons about Pikkon and the Other World Tournament. Later, the four members of the Son family appear dressed nicely. Gohan says that the adult division of the Tournament will begin this next year (in 1994), and the special comes to an end.